This year our Christmas carol service will be on Tuesday 18th December! This year our Christmas carol service will be on Tuesday 18th December! All Beavers, Cubs, Scouts, Explorers, Adults and family members are invited to join the Group at the Annual Christmas Carol Service at Bedworth All Saints Church. 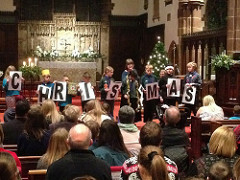 All Beavers, Cubs, Scouts, Explorers, Adults and family members are invited to join the Group at the Annual Christmas Carol Service at Bedworth All Saints Church. This event will run from 6.30pm to 7.30pm . Everyone is asked to arrive at the church between 6.15pm and 6.25pm so that everyone is seated by 6.30pm. All Beavers, Cubs, Scouts, Explorers and uniformed adults should wear their uniform. If you would like to brighten up your uniform with tinsel woggles and such like that would be fine. Free refreshments will be provided afterwards. Again this year we would like to help others through supporting a local Charity called Doorway. Doorway helps young people who are homeless. They support young people to learn skills to enable them to secure suitable housing, integrate in communities and look for and secure employment. We would appreciate it if everyone could bring along items clothing suitable for young adults for day to day wear or for going for interviews, toiletries, food (Non perishable) or a cash donation. We hope to see as many members as possible as we all come together for the final group event of the year!